Virtually every developed country is facing rapidly rising health care costs. There is a widespread consensus that the primary factor driving health care cost growth in most countries is the continual development and diffusion of new, and generally more expensive, health care technologies. 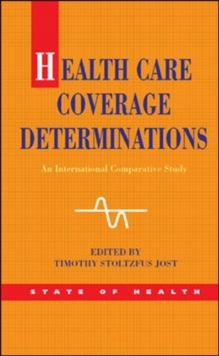 "Health Care Coverage Determinations" describes and analyzes the institutions and procedures that eight developed countries are using to assess health care technologies as they struggle to determine whether to pay for those technologies through public insurance programs or to lay some of these costs at the feet of the consumer.